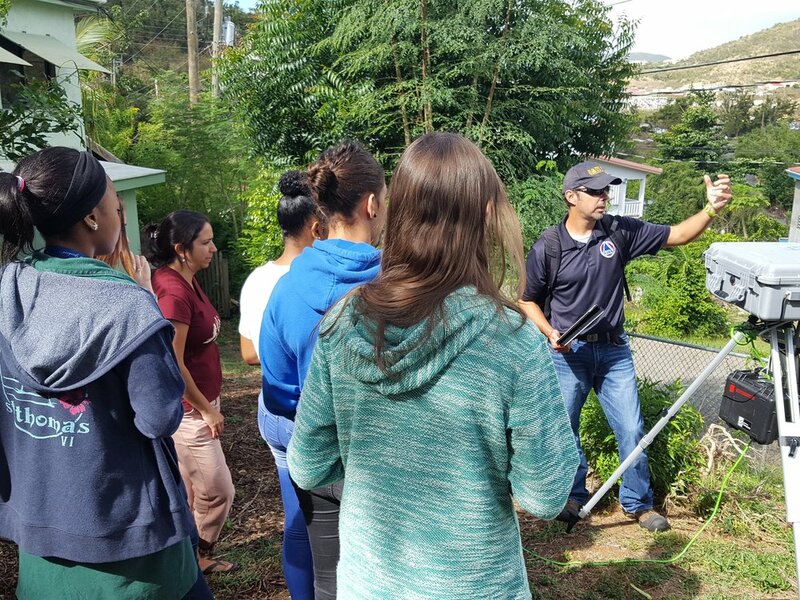 On Wednesday, the 12th grade Environmental Systems & Societies class welcomed two members of the EPA's Environmental Response Team to their classroom. Michael Hoppe and Joe Bundens spoke on a variety of topics ranging from air quality and environmental disasters, to fracking and water pollution. Having recently covered atmospheric systems, the students were well prepared to discuss sources of particulate matter, the reduction of ozone-depleting substances, and the impact of air pollutants on human health. Mr. Hoppe and Mr. Bundens spent time explaining how air quality monitors can be used to assess real-time pollution levels, particularly concentrations of particulate matter. Using a network of instruments on the East End, the EPA can monitor and address any increases in pollution that might be a result of the ongoing destruction of boats and other hurricane debris in the area. After examining a sensor placed on school grounds, the students returned to class in preparation for the next unit: Energy Usage & Climate Change. Household hazardous waste is still being collected at the Bovoni Landfill facility through Saturday, February 24th. According to the EPA: "Household hazardous waste includes aerosol cans, household cleaners and chemicals, paint, and electronic items such as computers and televisions. Household hazardous materials also include car and marine batteries, which have become a major concern due to the large volume of batteries being used by residents who are without power. Household hazardous waste should not be thrown out with regular trash as it can contaminate the land, waterways, and groundwater. "